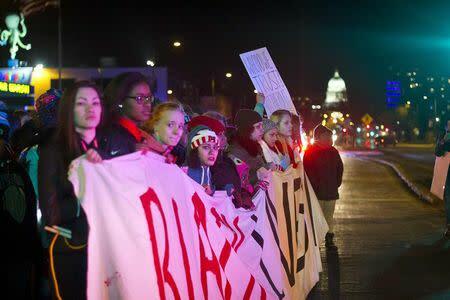 MADISON, Wis. (Reuters) - The fatal police shooting of an unarmed biracial teen in Madison, Wisconsin, has cast a light on the divide between the liberal whites that dominate the university city and its black residents, who said this week they feel marginalized. 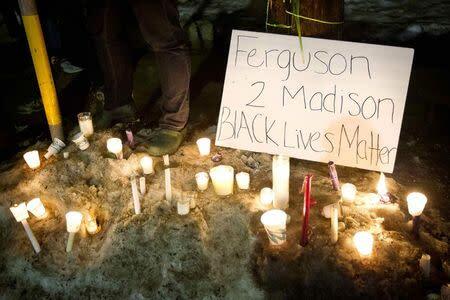 Since the death on Friday evening of 19-year-old Tony Robinson, Madison has seen days of protests and a measured response by the city's police department. However, the demonstrations still evoked memories of the violent clashes that erupted in Ferguson, Missouri, 350 miles (563 kilometers) to the south following the fatal shooting of Michael Brown in August. Robinson was shot after Officer Matt Kenny responded to calls about a man dodging cars in traffic who had allegedly battered another person, according to police officials. They said Kenny fired after Robinson attacked him. Madison, a city of 243,000, is perennially near the top of media rankings of the best places to live in the United States. But residents and Robinson's family said his shooting by a veteran police officer should force the city, with a 7 percent African American population, to look past the veneer of bike paths and music clubs to address the underlying issues of racism and poverty. Meaca Moore, 22, a sociology student who came from Columbus, Ohio, to study at the University of Wisconsin-Madison said the city's black residents deal with social isolation on a daily basis. "It feels like you're a walking circus, a freak show," said Moore, one of several dozen residents at a Madison Police and Fire Commission meeting on Monday evening. Many residents at the crowded meeting in Madison City Hall complained of persistent racism despite state and county task forces to deal with the issue. "Madison is the worst place a black person can live," Moore said in an interview. She is one of about 1,000 black students at the university's Madison campus, which has 42,800 people enrolled. Arrest, incarceration and poverty rates in Dane County - which includes Madison - tell the story of a black underclass. A recent report by the Wisconsin Council on Children and Families said that Dane County's racial disparities are more extreme than elsewhere in the state and across the United States. In 2012, the report said, eight African American adults were arrested in Dane County for every one white adult arrested, more than triple the national black-white arrest disparity of 2.5 to 1. "We have failed to provide opportunities and we have failed to provide resources, but we do not fail to lock their asses up," said Brandi Grayson, a member of the Young Gifted and Black Coalition. As in the St. Louis suburb of Ferguson, a town of 21,000 that is about two-thirds black, traffic stops show racial disparities as well. Despite school and city initiatives to address racial disparities, half of Madison's black residents do not graduate high school, a third live in poverty and a fourth do not have a job. Protesters have praised Madison Police Chief Michael Koval, who is white, for pledging transparency and apologizing for the shooting, but said the city still needed to make changes. Three days of peaceful protests in Madison, including a crowd of about 2,000 people, mostly high school students, who demonstrated in the Capitol rotunda on Monday, resulted in no arrests. That stood in contrast to the rioting that erupted in Ferguson following Brown's death and a November grand jury decision not to indict the police officer who shot him. Protests spread across the United States last year after a New York grand jury cleared a police officer in the choking death of Eric Garner. A scathing U.S. Justice Department report found widespread racial bias in Ferguson police and court practices that targeted fees and fines mainly at black residents of the town. "The police reaction has been better than in Ferguson so it's not going to get out of control," said Darrian Henning, a 16-year-old African-American from Sun Prairie High School, the school Robinson graduated from in 2014. Koval said comparisons to the Brown shooting were inevitable, but his force had a better relationship with its community than Ferguson police. "Whether I like it or not I am inextricably tied to the Ferguson phenomenon," Koval told CNN on Tuesday, adding he would like to believe that Madison police will not be defined by the shooting. Robinson's uncle, Turin Carter, warned against a simplistic explanation of his nephew's death based on race, but said Madison has work to do on racial issues. "It's an air of liberalism that's pushed and perceived mostly because of UW as being progressive in its history," Carter told reporters on Monday. "But when you look at the capitol, things are a little different in terms of who's actually running the government."